We are finally over the sickness hump and everyone in the house is starting to feel better. I think I have spent the last 3 holiday breaks being sick....ugh to bad timing! Have you heard the saying "getting your ducks in a row"? Well I've been getting my penguins in a row. January is the month we study penguins and I already have a lot of activities but over the last few weeks I have been gathering and making more. Below are just a few of the things I have pinned on my 'Penguin Pinterest Board'. I love the paper tube penguins. I'm pretty sure I have enough empty tubes from the holiday to cut up and make them. I'm also making a set of centers using the new penguin clip art. I will post a picture here as soon as I have it done. I wish we had time to make all of them....they are all so cute! We are going to do the paper tearing penguin as it will provide fine motor and visual discrimination practice. I also think we will make these, just because they are so cute. We also do a fun penguin glyph. I will share pictures and directions for those after I go back to work next week. They are really cute and make a great bulletin board. The January Homework Packet for Kindergarten needs a bit more tweaking but it will be posted soon, hopefully tomorrow. It's assessment and report card month for me so the packet reviews many of the skills the children will be assessed on. 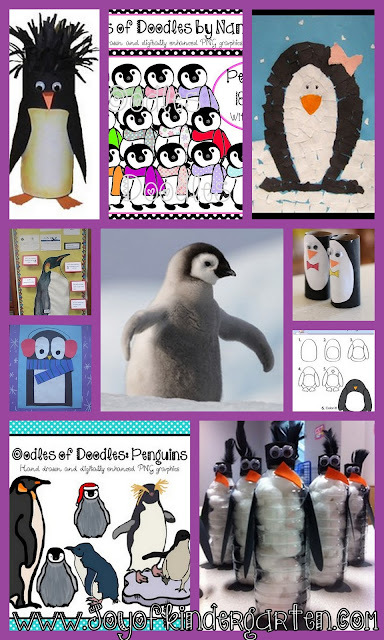 Do you have an awesome penguin activity that Kinders would love? Please link up below so we can collect lots of great ideas!! Please remember to link to your post and not your blog so that everyone can read about your great penguin activities. 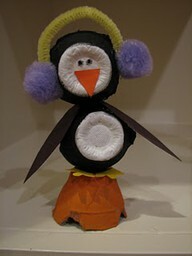 The penguin crafts are too cute!